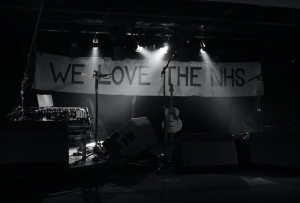 In an old-school style, LAU began their set at The Brewery in Kendal with three chairs and a microphone, a simple acoustic set-up which was reminiscent of their early form. 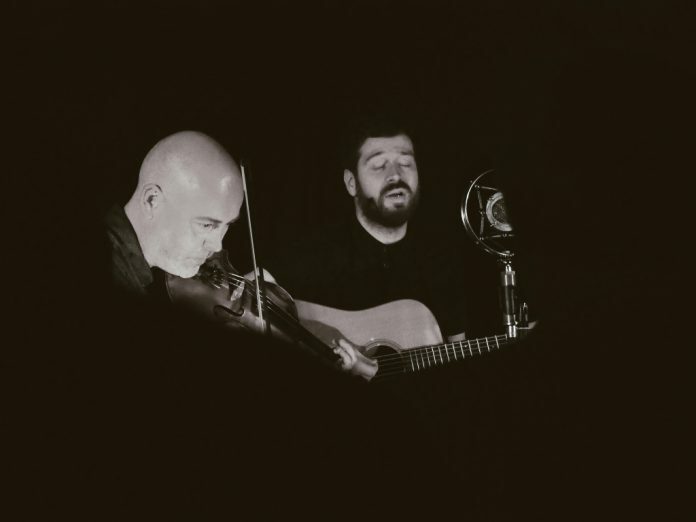 This experimental folk band, on their Decade tour, reminded the audience that firstly they are three exceptionally talented musicians, and secondly that they have come a long way from their origins. Long gone are the days when the merchandise stall consisted of a single CD and some of their instruments were held together with gaffa tape. Having won the Best Band at the BBC Folk Awards from 2008-2010, and in 2013, they have earned their status in the music world. It’s been a decade since I first saw LAU perform at the age of 8, and while I have seen them many times since, I can never say I’ve seen them play the same song twice. Each time I see this award-winning trio, their ability to reinvent their material never ceases to amaze me. 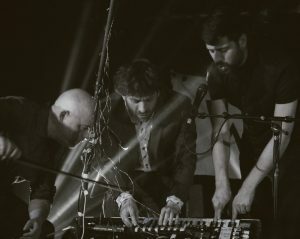 After the acoustic opening, the curtain was drawn back in the second half to reveal a wealth of technology, homemade synthesisers and pedals of all shapes and sizes, offering a sort of visual representation of their progression as a band. Touring their fifth album ‘Decade’, a compilation of their best works, LAU can only be described as innovative inventors, playing everything from jigs and reels to almost soundscape-like walls of synthesised sound. They not only write songs about political issues, such as ‘Throwing Pennies’ which hauntingly explores the lives of the homeless but also sings about the every day, ‘First Homecoming’ for instance which explores a new home, whatever this may be. The standout performance of the night, for me, had to be ‘Ghosts.’ This is arguably one of their most well-known songs, and it looks at migration, the movement of people and an escape from the hardships of life. The song has always been tearful, but the sheer investment of the three musicians on stage and their ability to express such devastating emotions through music was incredible. Chatting to Martin Green (accordionist) afterwards, he said “I’ve been coming here for about 20 years, and it’s a great place. The people are accommodating and friendly, I always have a great time. They put on lots of good stuff, places like this change the whole character of a town.” It’s band’s like LAU and venues like The Brewery that make the music industry what it is, and we cannot thank them enough for their tireless efforts to bring us fantastic music. The reason folk music continues to be on the rise, as shown by the ever-increasing popularity of bands like LAU, is because they speak of everyday issues people face while showcasing our historical culture in the form of more traditional music. So thanks lads, and here’s to the next ten years! ‘Decade: The Best of LAU (2007-2017)’ is out now!